Gaston of France, Son of France, Duke of Orléans (Gaston Jean Baptiste; 25 April 1608 – 2 February 1660) was the third son of King Henry IV of France and his wife Marie de Medici. As a son of the king, he was born a Fils de France. As a young boy he was given the title of Duke of Anjou. 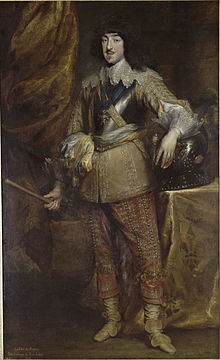 Later he had the title Duke of Orléans. As the eldest surviving brother of King Louis XIII, he was known at court as Monsieur. He was also one of the first princes to use the style of Royal Highness. He is often also referred to as Gaston d'Orléans. His grandson the last Medici Grand Duke of Tuscany was named in his honour. Marguerite Louise d'Orléans (28 July 1645 – 17 September 1721) married Cosimo III de' Medici, Grand Duke of Tuscany and had children. Élisabeth Marguerite d'Orléans (26 December 1646 – 17 March 1696) married Louis Joseph of Lorraine, Duke of Guise and had children. Françoise Madeleine d'Orléans (13 October 1648 – 14 January 1664) married Charles Emmanuel II, Duke of Savoy but died childless. Jean Gaston, Duke of Valois (Paris, 17 August 1650 – Paris, 10 August 1652) died young. Marie Anne d'Orléans (Paris, 9 November 1652 – Blois, 17 August 1656) died young. Marie bâtarde d'Orléans 1 January 1631, Paris. Jean Louis bâtard d'Orléans, Count of Charny, (1638, Tours-1692, Spain). 25 April 1608 - 6 August 1626 [His Royal Highness] The Duke of Anjou. This page was last changed on 15 July 2016, at 16:45.